Sister Marge and I just returned from the Northeast Region Lecturers Conference and what a great time we had. You may have noticed that the name of the conference has changed. Most of you remember it as the New England Lecturers Conference. 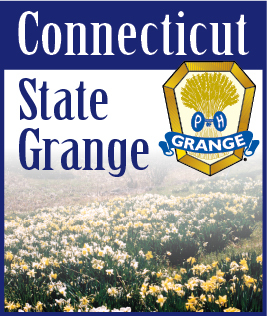 Well we have a new member to our region and it is the New York State Grange. This was their first Lecturers Conference although they have been a part of us for awhile. Although this was new to them and they were small in number they had a great program and fit in with us perfectly. They enjoyed themselves and promised to return next year with a bigger group. As usual sister Marge Bernhardt had a terrific program for us to perform and I think we did Connecticut proud. I hope there are pictures in this edition to show us off. I mentioned in an earlier edition that I was looking into a project to provide assistance to some of our struggling Granges. Well I assembled two groups of people, one from the east and one from the west of the state. We met on two separate nights in June with brother Rusty Hunt, the Membership/Leadership Director of the National Grange. He met with each group asking questions about our Granges. He was trying to find out about us and what some of our particular problems are. He was impressed with the two groups and liked our attitude and said with instructions from his team we could accomplish our objectives. Because of the scheduled activities in August and September and our State Session in October and National Session in November, the soonest he and his team can visit us again for instruction will be the middle of January 2009. We are looking forward to their help as their methods have been successful in other areas. In the meantime our groups will be doing preliminary work, mostly unseen because we are not yet ready. Lastly for now, we have a great opportunity to educate the public about the Grange. I am talking about the New England Grange Building at the Big E. Because of the success of the country store that is in the building we have made some very good profits over the last few years. These have made it possible for the Trustees to make repairs and improvements to the building. Addition of a gas fireplace, a fire alarm system tied into the local fire house, repainting the building and numerous cosmetic changes inside has made our building one of the most popular at the fair. This is all due to the few who actually run the store. Sister Betty Jane Gardiner has a dedicated staff to help her but there are several times when the store is understaffed. I am asking anyone who might be able to help to contact Betty Jane. She and I will appreciate it. The group of Grangers from all of New England that marched in the parade last year, on Grange Day, was such a success that we will be doing it again this year. If you can attend that day I will give you tickets and parking passes for the fair and all you will have to do is march with us in the parade. The date is Sunday, September 21. Enjoy what is left of the summer and to help you enjoy it visit a local Grange Fair.